My name is Robert Kittilä and I live in Boulder Colorado and am an avid PPG pilot. I designed the Lefty Bar about a year ago for a close friend and inadvertently came up with a product that appeals to every pilot I’ve met! I had just discovered PPGs and had gotten a DK with a wing. 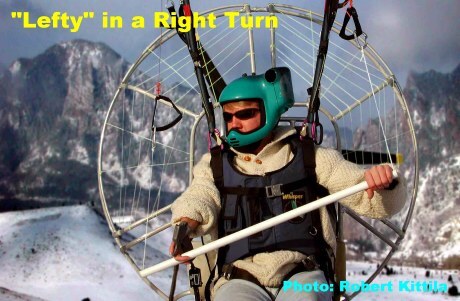 I had learned to handle the wing through paragliding lessons, and then learned my motoring skills from Bill Duffel, a veteran pilot from Houston. I loved my new sport and spoke about it to many of my skydiving buddies. One of these buddies that showed interest in this new sport of mine was Mike “Lefty” Smith. I had made several skydives with Mike over the past years and he is one remarkable guy. Mike is from Denver, is 30 years old and an amazing athlete. He is a scuba instructor, a skydiving cameraman, skateboarder, BMX biker, snowboarder, and was drafted to play semi-pro football as a kicker, due to his high school all-conference record of a 49 yardgame winning field goal. He is also a member of the infamous “Pieces of 8” skydiving team. This sounds like your average extreme athelete,. The only difference is that Lefty was born with a deformed right arm. It is half the length of his left arm with no elbow and only 3 fingers. This was the result of his mother’s prescription of Bendectin, a supposedly safe replacement forThalydimide, the now maligned drug used to prevent morning sickness. Mike wanted to learn to fly my PPG. I taught him to kite in two hours. The reverse launch was no problem…the forward launch is still a bit tricky, but he can do it. As we all know, launching at 6000 feet AGL is hard enough, but with his added handicap, it can be a daunting task. The big day came and Mike was ready. We went to my favorite launching site, a wonderful open slope with 270º launching direction and spectacular views of the Rockies. Winds were 8-10 mph. Lefty did a perfect reverse and was airborne in 12 steps. He got seated and started flying but could only turn left. After a half a dozen circles, he landed with perfect stand up form. He was elated and we went home to celebrate. That night I lay awake wondering what I could come up with to help him turn in both directions. It had to be light, small and not get in the way of launching and landing. The next morning over my cappuccino, it suddenly dawned on me. 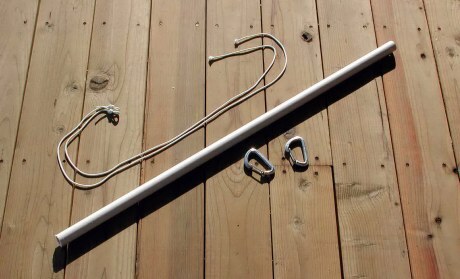 I rushed out to the local mountaineering store, bought a couple of lightweight carabiners and then picked up a remnant 2 foot 3/4” PVC pipe at the hardware store. Back at home, I got two 18” nylon strings, drilled two holes in the PVC and put it all together. I spent less than $5 and couldn’t wait to test it. 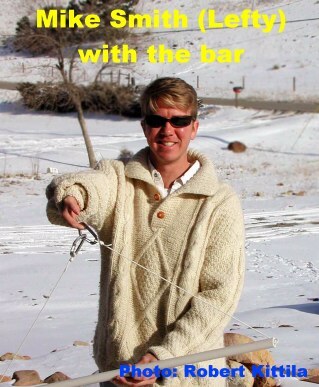 I launched from my front yard in my normal manner, using my toggles and letting the bar just dangle on my chest. Once in the air, I grabbed the bar with one hand, slithered into my seat and made a couple of turns in either direction. I then made some deep turns to see how much pressure I needed to get the response out of the wing. I was satisfied. Now came the landing. I grabbed the toggles, let the bar hang down, not even noticing the bar during the final flare. I made a couple of adjustments to the line and gave it to Lefty. He loved it and and now makes wild turns in all directions. I like it so much I don’t even consider flying without it.. For me, the ” Halleluja” arm position is no longer necessary. Give it a try, I bet you will like it. Lefty has since got his own Walkerjet Spider RR and a Eden wing. He is my regular flying partner. Being tinkerers, we now are working on the cappuccino cup holder, the GPS mount, and a laptop computer bracket for the bar. Now, how am I going to get Lefty’s snow angels to improve…?